We are seeing a generation of children and teens with excessively high levels of stress, and, as a result, an explosion of emotional, social, learning, behavioural and physical health problems in young people today. But few parents recognise the 'hidden stressors' that their children are struggling with. Help Your Child Deal With Stress - and Thrive is a ground-breaking parenting book, where Stuart Shanker argues that by teaching children the art of self-regulation, it can transform their behaviour and help them to identify, talk about and manage their emotions. This leads to a harmonious home and children who feel nurtured and supported. Mastering the art of self-regulation can help children learn to deal with experiences, overcome frustration, pay better attention, engage better with others and enhance their learning capabilities. In turn, children will develop the confidence, along with the skills and emotional strength needed, to navigate the pressures and stresses of the modern world. Underpinned by science, Dr Shanker's techniques have had a remarkable effect on children and parents alike, and hundreds of thousands of children who have gone through the programme in Canada have shown significant improvement in literacy, numeracy and behaviour. 'Brilliant. In this illuminating and accessible breakthrough book, Stuart Shanker makes a powerful case for understanding children's behavior and misbehavior using the lens of self-regulation. I will never see children in the same way. Self-Reg is a ground-breaking book that presents a new understanding of your child's emotions and behaviour. 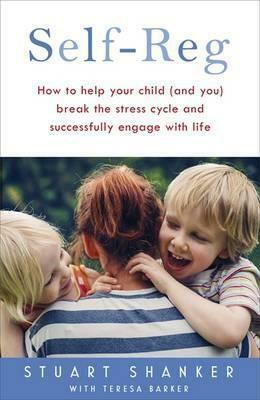 Leading child psychologist Dr Stuart Shanker translates his decades of research, along with his years of experience in working with children, to present a practical guide for parents to help their kids engage calmly and successfully in learning and life. We are seeing a generation of children and teens with excessively high levels of stress and, as a result, an explosion of emotional, social, learning, behavioural and physical health problems in young people today. But few parents recognize the 'hidden stressors' that their children are struggling with: these can be physiological as well as social and emotional. When kids are stressed and anxious, they often struggle to articulate what is troubling them and either start to misbehave, or else shut down and fail to communicate at all. This is often construed as 'bad behaviour' by parents, and treated as such. An entrenched view of child rearing is seeing our children as lacking self-control or willpower, but the real basis for these problems lies in excessive stress. Self-regulation refers to how effectively we deal with stress and then recover. Mastering the art of self-regulation can dramatically improve a child's mood, attention, and concentration. It can help children to feel empathy and to develop the sorts of virtues that every parent knows are vital for their child's long-term well. Remarkably, self-regulation brings about profound and lasting transformation that continues to mature throughout life. Self-Reg offers parents practical, prescriptive advice as well as concrete ways to develop their own self-regulation skills and teach their children how to do the same for optimal learning, social and emotional growth. In short, Self-Reg will give parents the confidence to help their son or daughter develop the skills and emotional strength needed to navigate the pressures of the modern world. Dr Stuart Shanker is Distinguished Research Professor of Philosophy and Psychology and head of a psychological research lab at York University in Toronto, Canada. He's won numerous awards, lectured at Harvard and other leading universities, given keynote addresses at major gatherings, appeared on the Today Show and CNN and been interviewed by The New York Times, WSJ and others. The book has been written with Teresa Barker who is a journalist and has co-written many books, including the New York Times bestseller Raising Cain: Protecting the Emotional Life of Boys. Her specialisms include parenting, child development and psychology.